There are many people I interact with on a daily basis who I believe have an irrational fear of chemicals. Not a specific chemical, but chemicals in general which, as a chemist, I find utterly ridiculous. The origins of this chemophobia may lie in the past use of chemical weapons and industrial disasters, but it has since moved into the realm of fantasy where specific chemicals are given unfavorable properties they don’t have. Fanning the flames of this irrational fear is a torrent of self-proclaimed experts who reinforce and amplify these irrational fears for their own goals. People who perpetuate the idea that every scientist, corporation, and government has nothing better to do with their time than purposely expose the general public to dangerous chemicals for shits and giggles. I have taken it upon myself over the past few years to do my part in chipping away at some of the misconceptions and misinformation spread by these people and have decided to continue my crusade against chemophobia by tackling more random compounds the Food Babe has targeted. 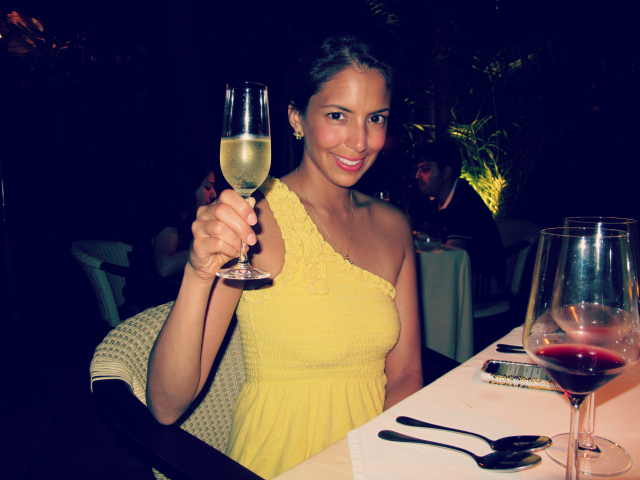 The Food Babe AKA Vani Deva Hari is an American blogger and activist who has made a very comfortable living finding chemicals used in food manufacture that also happen to have an industrial use, and telling people to not eat them because……reasons. For example, in 2013 she led a complaint to stop Subway from using a compound called azodicarbonamide in the production of their bread because it’s also used in plastic manufacture…….that’s it. There is honestly nothing more to that story, yet unbelievably Subway bowed to her demands. This gave people the impression that the chemical was, indeed, dangerous whilst simultaneously giving the Food Babe unwarranted credibility. This wasn’t the only random chemical she decided to campaign against that year, and in March of 2013 she started a petition asking Kraft to stop “using dangerous food dyes in our mac & cheese”. Her petition was to stop kraft from using the synthetic food dyes Tartrazine (FD&C Yellow 5) and Sunset Yellow FCF (FD&C Yellow 6) in their mac & cheese. It gathered 365,806 signatures which forced Kraft’s hand to not only remove the artificial dyes from their mac & cheese, but also prompted them to remove all synthetic dyes from their entire product line. It was another victory for the Food Babe, but was it a victory for the american consumer? or had they been misinformed by a charlatan? Let’s find out by going through her argument to remove the dyes one by one. 1, It was made in the laboratory with chemicals derived from petroleum. 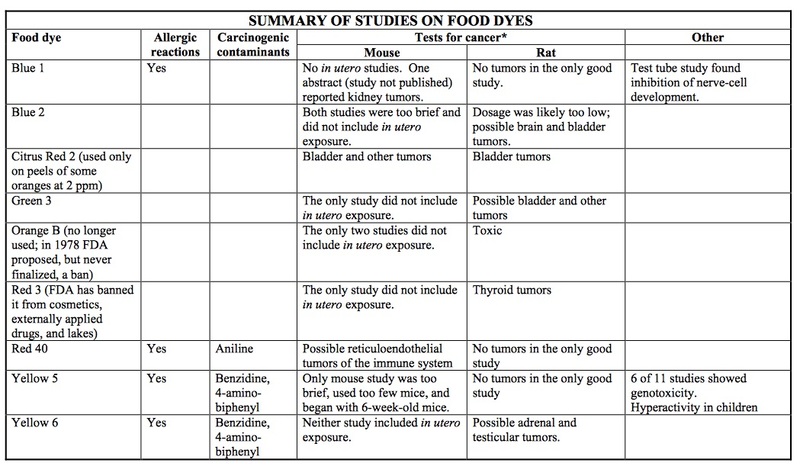 In the video above, Food Babe lives up to her name as the queen of chemophobia when she says that the yellow dyes must be avoided because they are “made in a lab from chemicals derived from petroleum”. It is true that these two chemicals are made in reaction vessels rather than having natural sources, but this has no bearing on their toxicity. A compound does not suddenly become toxic because it is made in a lab and will have identical properties to the same compound found elsewhere. Likewise the ancestry of a compound has no effect on its toxicity. Tartrazine no more remembers its petroleum origins than the painkiller paracetamol. I have to admit I was curious to know what specific petroleum derived compound the Food Babe was referring to, as she never mentioned it by name. I probed her entire website for what felt like an eternity and found nothing, which led me to believe that she doesn’t know herself. She seems to have parroted what thousands of other people have said online, all without taking the extra step of identifying what is essentially the crux of their argument. It really was astonishing to see website after website; page after page, all saying the exact same thing, but none of them stating what chemical it was and why it and its derivatives should be avoided. I decided to identify this mystery compound for myself and, looking at the two dyes and being a bit of a whiz at retrosynthetic analysis, I can see that both were probably made using 4-diazobenzenesulfonic acid. This compound can be made from sulfanilic acid which is produced by the sulfonation of aniline. Aniline is made industrially from the nitrate and then hydrogenation of benzene, which is one of the elementary petrochemicals. There we have it! 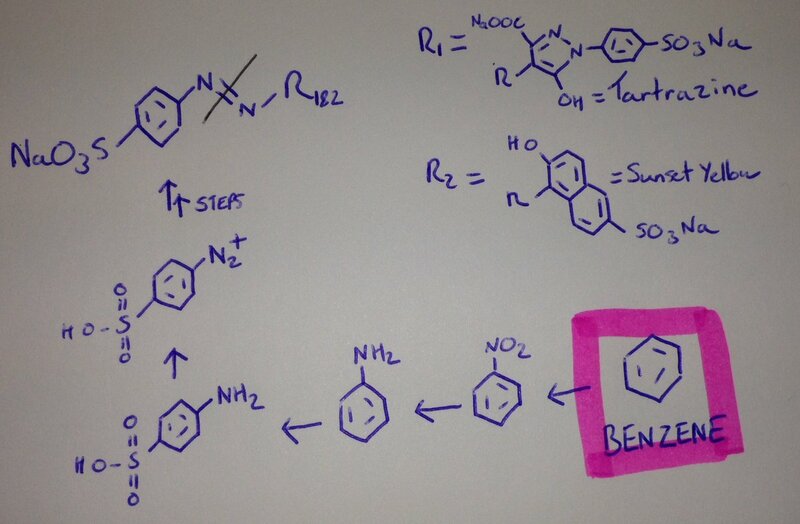 The mystery petroleum based starting material was benzene all along! So I guess we have to avoid all products whose origins lie with benzene? The only problem here is that benzene is one of the core building blocks of organic chemistry and is used in the manufacture of so many compounds, it’s hard to know where to start. It’s used to make the acetone in the nail polish remover the Food Babe presumably uses, as well as the phenol used to make paracetamol for when she, like me, has had one too many. Implying that products derived from benzene should be avoided takes a person with a special mix of arrogance and stupidity. The Food Babe then goes on to link gasoline, asphalt and tar to the synthetic dyes, giving the uninformed viewer the impression that this is what they are actually eating. 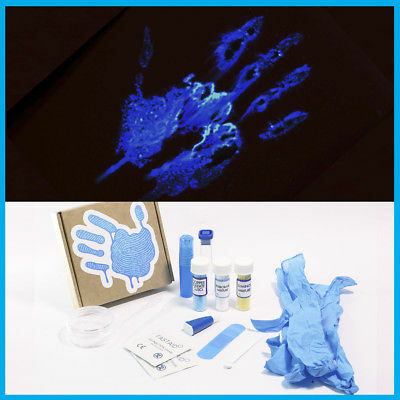 These dyes may or may not have been synthesised from benzene but they are now different molecules and, therefore, have different properties. This is beyond deceitful and painfully transparent. 2, Yellow number 5 and yellow number 6 are known carcinogens. No….they are not! That was easy! What makes this claim particularly hilarious is that it is contradicted on the Food Babe’s own website! Instead of saying that these dyes are known carcinogens, it says that they “can be contaminated with known carcinogens” – which is very different! To back up her claims, the Food Babe references a blog post by the Center for Science in the Public Interest which states that the dyes can be contaminated with the known carcinogens benzidine and 4-amino-biphenyl. As we all know, it’s the dose that makes the poison, so the fact that the blogpost failed to mention the amounts of the carcinogenic compounds found in the dyes makes this information useless. I was, however, able to track down some ballpark numbers regarding the contamination of Tartrazine with benzidine. According to the European Food Safety Authority in their report ’Scientific Opinion on the re-evaluation Tartrazine’ benzidine contamination was found in levels less than 5ng/g. This number is so small and it is only because of advances in analytical chemistry that are able to detect it at all. This, coupled with the fact that only very small amounts of the dye are used in food, means that the amount of this known carcinogen in your food poses no real threat. It is hypocritical of the people like the Food Babe to say that we should be worried about these trace amounts in our food when they are known to consume, in larger quantities, a known carcinogen. 3. They have been known to increase hyperactivity in children. Here, the Food Babe references another Centre for Science in the Public Interest blog post which, in turn, referenced the paper ‘Food additives and hyperactive behaviour in 3-year-old and 8/9-year-old children in the community: a randomised, double-blinded, placebo-controlled trial’. The paper, which is also known as the Southampton study, took 153 3-year-old and 144 8/9-year-old children and gave them a drink containing sodium benzoate and one of two artificial food colouring mixes. The children were then scored on their hyperactivity and overall behaviours and it was reported that those who drank the mixtures had significant adverse effects. There are many problems with this study, starting with the fact that because they used a mixture of artificial food colourings and sodium benzoate you can’t say which one is responsible for the negative effects apparently observed in the children. Also, artificial food colourings are vastly different from each other and, therefore, will have different toxicity, metabolisms, and effects on people. Painting all artificial food dyes with the same brush (as so many people do) shows a deep ignorance of chemistry. The paper was also bashed by the European Food Safety Authority who used it to evaluate people’s acceptable daily intake (ADI) of artificial colours. The problem the European Food Safety Authority brought up about the paper was the lack of “biologically plausible mechanism for induction of behavioural effect from consumption of the food additives”. 4. Are banned in countries like Norway and Austria. So what?!?! Kinder Surprise eggs are banned in America. There is a different version of Marmite sold to the Canadians because the UK versions formula contains ingredients that are not approved there. How many countries can you list where alcohol is banned?! The Food Babe was, however, correct about one thing. They don’t change the nutritional value or the test of the food they are in. They are just there for aesthetic reasons and can be replaced or not used at all. There are valid reasons for not wanting these dyes in your food like, for example, the fact that a small percentage of the population are sensitive to them. Telling people they must be removed because they are derived from petroleum, that may be contaminated with carcinogens, they cause hyperactivity in children, and because they are banned in different countries is not giving valid reasons. The Food Babe has, once again, made a storm in a teacup and got people all wound up about nothing whilst, at the same time, fanning the flames of chemophobia, which is becoming more in fashion these days.